Mike's not one for flowers and chocolate. He's never really been that big into holidays. I was impressed when he sent me an email last Thursday morning wishing me a Happy Valentines Day. It made my day, because it showed he was thinking of me. Yeah, that's about as sappy as he gets. And, I'm okay with that. He's given me flowers exactly once in our 5 years together and it was in the first couple of months of dating. I, on the other hand, love gift giving and making holidays special. I made him a card, bought and wrapped a bunch of his favorite junk foods, (we've been eating really healthy lately in preparation for the wedding so, it was a nice treat), and also grilled a steak, (per his request). I even grilled outside in the 20 degree weather because it's so much better on the grill, and I'm pretty damn good at it too! 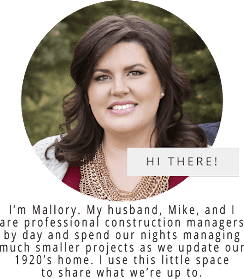 I was thinking of how different we are in our "love languages", when I realized that Mike shows me he loves my in his own way - by building me things. 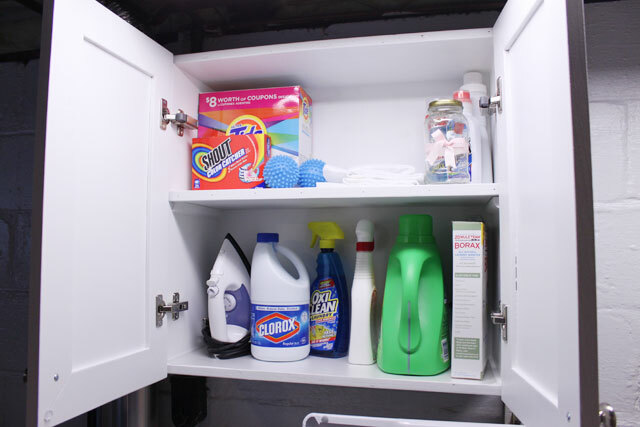 When we were cleaning and organizing the laundry room I mentioned that I would love to have some storage for the laundry items like detergent and the iron. 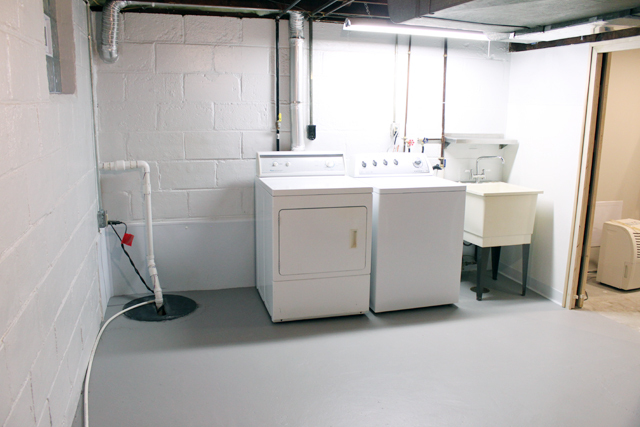 (I would love to have a fancy shmancy laundry room that I could decorate and enjoy doing laundry in, but I'll settle for some designated storage). Mike went out in search of a cabinet to fit the space. 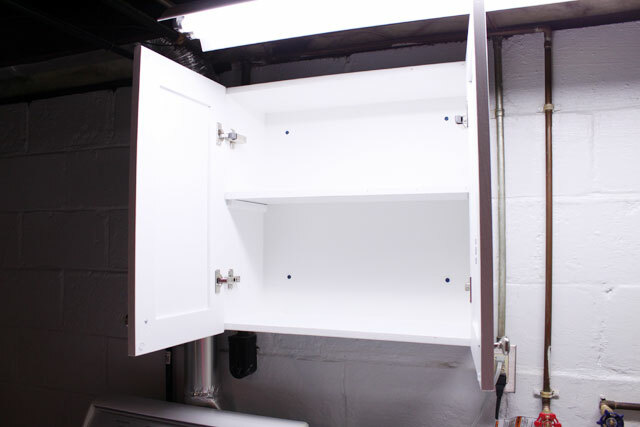 Unable to find a cabinet to fit in between the dryer vent and water lines and such, Mike decided to build me one, because that's what he does, my crazy furniture building fool. On Valentines day it was finished and ready to stock up. It's probably the worst thing to photograph since it's right under the florescent light, but it's too dark in the room to do anything with the light off. 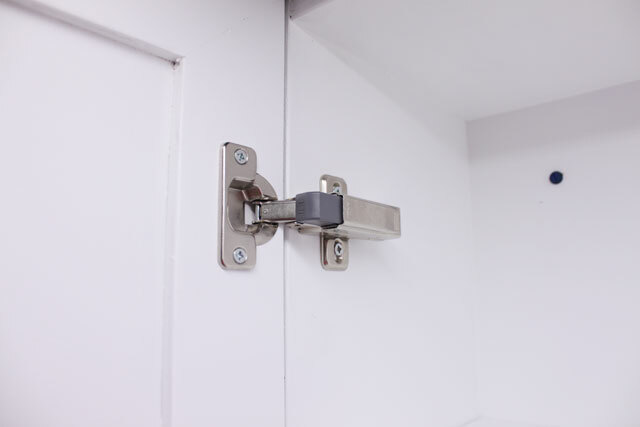 He even earned bonus points for adding soft close hinges. It's the little things that excite me! 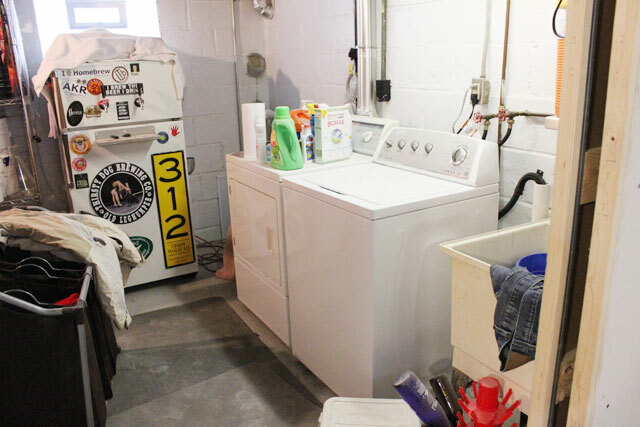 It's not trendy, and even looks kind of awkward in the space, since we were confined to that small space in the middle of the washer and dryer. But, I think it's the most beautiful thing in the world. And, it's made doing the laundry a little more bearable. He measured and made sure even the largest liquid detergent fit. To bring this story back around, the jar on the top right is actually a spaghetti jar that we cleaned and used as a vase for the first, (and only), flowers Mike bought me. We were poor cheap college students at the time and it was what was on hand. I added the ribbon to make it pretty and after the flowers died, Mike cut a slot in the lid and we've used it as a piggy bank ever since. I thought it was a perfect place to put it so that I can add any change that I find in his pockets! 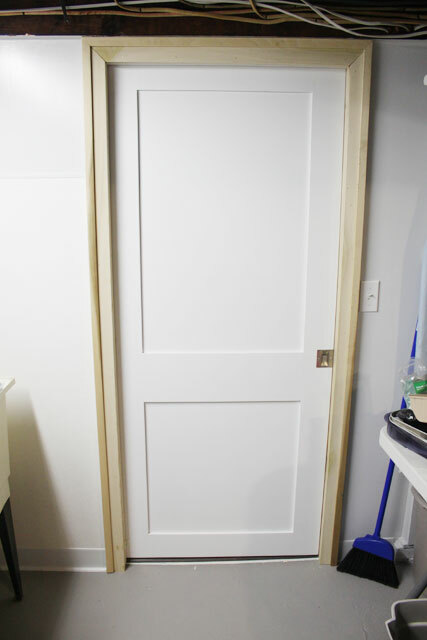 And, I'll share the other improvement that Mike made to the laundry room, the pocket door. He' actually installed the "pocket" part maybe a year or two ago when we removed the old oak built-ins, (seen here in the basement before photo in our home tour). But, it wasn't until recent that he installed the door and the trim around it. 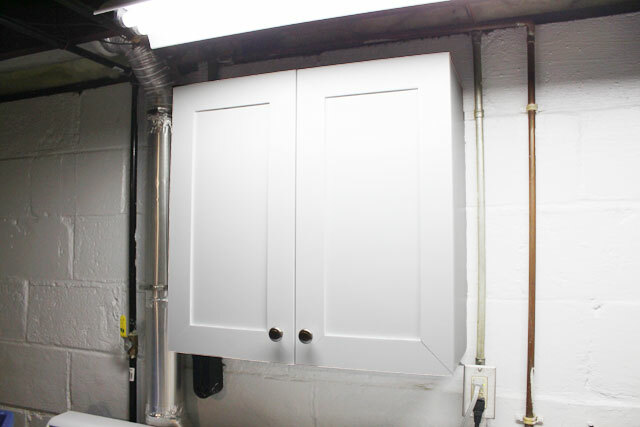 We figured with repainting the laundry room, we might as well finish out all the details we can, even if it is just a laundry/storage room. 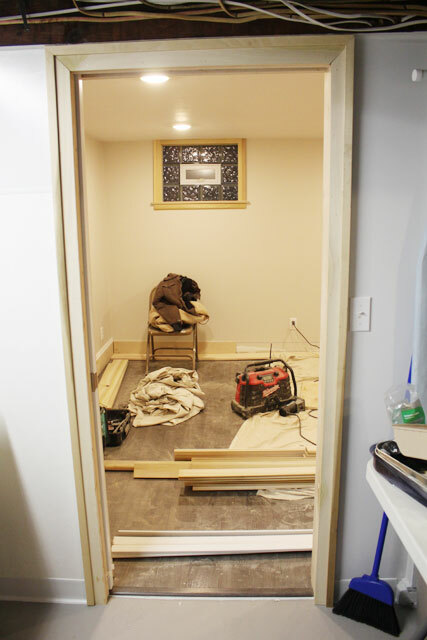 I still haven't painted the trim, but the door is awesome at keeping the sawdust out of the laundry room, and it's working great at keeping the sound from the laundry room out of the family room. 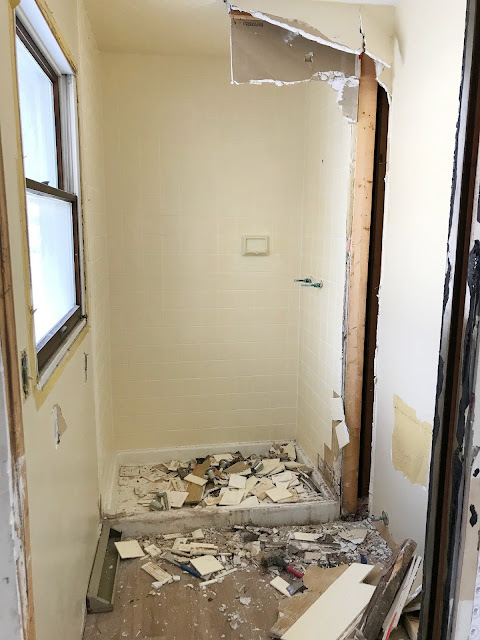 We haven't needed this too much lately, since the sound of belt sanders and chop saws usually drown anything out, but when we install a TV in that room, we knew we wanted to keep the sounds of the washing machine and dryer from being too disruptive. That is a great Vanentine's Day gift! When everyone else's flowers die, you'll still be able to do laundry. In a good way!